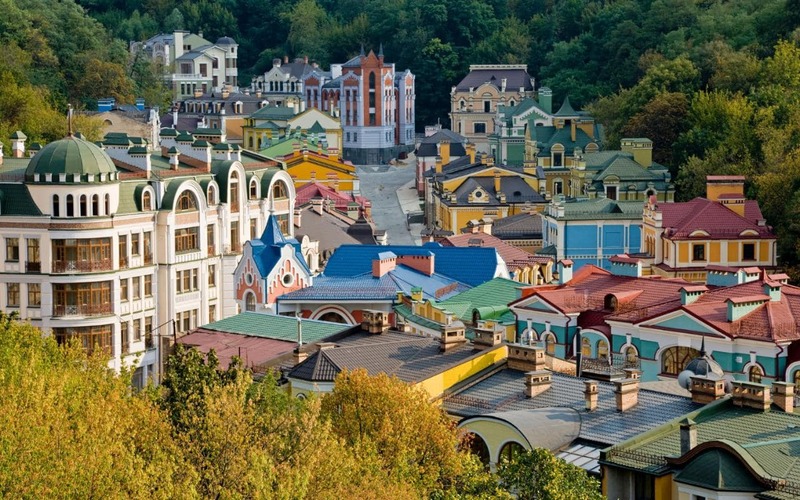 Kiev is a beautiful city and a center of industry, science, education, and culture. it has a thriving high-tech industry and quality universities. There is an extensive public transportation (a bit inconvenient from our location however), including a metro system. What struck me right off is the large number of superb buildings. Russia underwent an industrial revolution in the late 1800’s, as a result of which Kiev became a center of trade and transport. Sugar and grains were main products of the trade and the transport system, mainly the Dnieper River and rail lines. 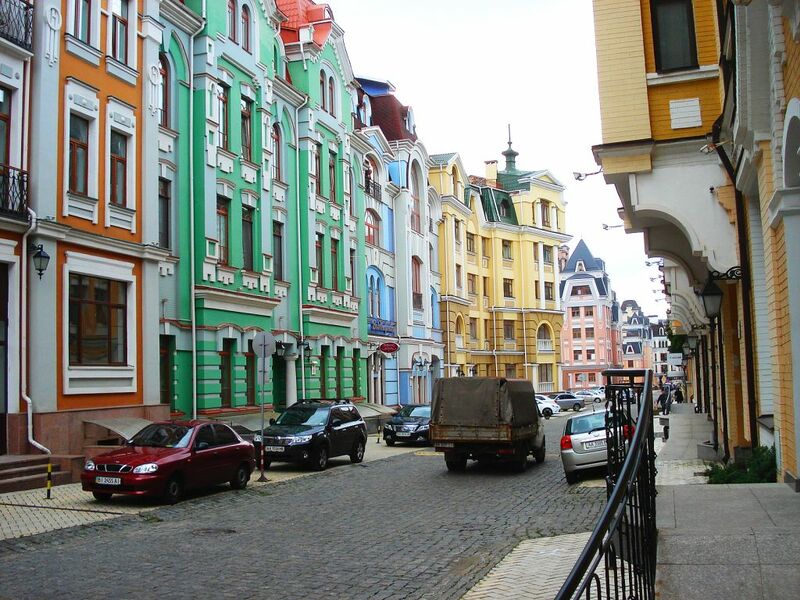 During the Soviet industrialization the city also prospered, when as it happened the city population switched from Russian to Ukranian in large measure due to migration within what was then the Ukranian Soviet Socialist Republic. It suffered heavily during the Great Famine when millions died, and Stalin’s purges eliminated much of the intelligentsia. The Nazis murdered at least 34,000 Jews, with another 70,000 civilians meeting a like end. An astounding 8 million died during WW2, when both the Nazis and Soviets engaged in scorched earth policies. The city is just 100k/60 miles south of Chernoybl, barely escaping fallout due to the prevailing winds at the time. Perhaps the most famous of its landmarks is the 11th century Byzantine style Saint Sofia Cathedral, named after the 3rd century Hagia Sofia church in Istanbul, to which there is little if any resemblance. 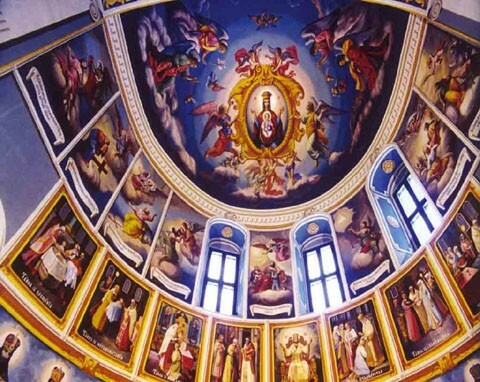 There are 5 naves, 5 apses and 13 cupolas and original mosaics and frescoes. 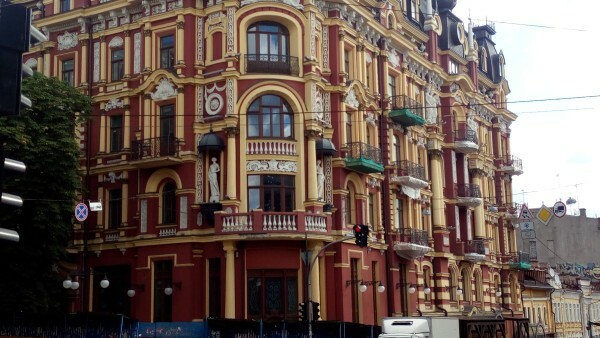 From the late 12th c until the early 17th it was in poor repair, when it was renovated in the distinct Ukrainian Baroque style. 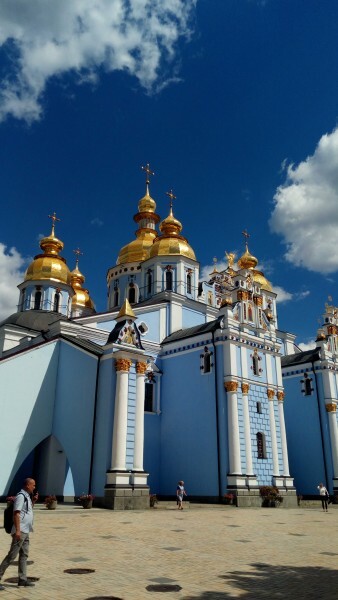 It and the Kiev Cave Monastery were Ukraine’s first World Heritage sites. 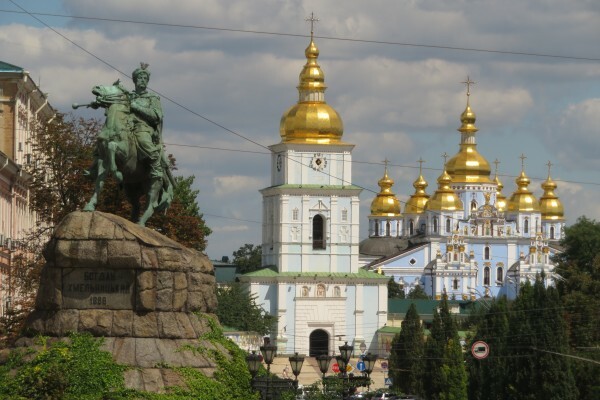 Kiev dates from as far back as the 5th century, with signs of habitation from the Stone age. It has been ruled by Khazars, Vikings, Mongols (who destroyed the city in 1240), Lithuania, Poland and Russia until 1918, then after three years of independence, in 1921 it was taken by Soviet Russia, remaining under its thumb until the iron curtain rusted away other than the Nazi occupation. Today, here we are again with Russia, which took Odessa, an important port on the Black Sea. The country’s residents, other than perhaps the Russian minority, look nervously at its large, militarily powerful and increasingly aggressive neighbor. In the capital, at least, there is much pro-EU sentiment, which in its turn makes for nerves in Moscow. Despite appearances, at least in the capitol, Ukraine is a poor country, with a per capita income of just $8000 (2013), versus about $11,000 in Russia and $50,000 in the US. Militarily there is a huge Russian advantage, of course, as well as in population – 42 million versus 145 million. It gets all its natural gas and transport fuel from Russia. The natural gas pipeline from Russia to Europe goes through the Ukraine, making it strategically important both to the EU and Russia and thus to the US. Glad you found it useful. Very interesting country, wish we had more time to get to know people here. They face unusual problems and are very bright and energetic. English is widely spoken in Kiev, maybe less so in the countryside although one woman started talking to us near a church. She wanted to know where we were from and why we came here. She said she did not like Kiev,too impersonal. I knew immediately she was from a small town, which she confirmed. Her English was quite good, based on that conversation anyway, not even a very strong accent. So maybe even in small towns they learn it well. This is important if you want to have visitors from Europe, which they do.